Aalesund Stadion or Color Line Stadion for sponsorship purposes, is a purpose built football stadium located in the Norwegian sea port city of Ålesund. Inaugurated on the 16th of April in 2005, the ground is home to Tippeligaen side Aalesunds FK and cost an estimated NOK 160 million to build. Color Line stadion was inaugurated with a victory on 16th April 2005 when Aalesunds FK took on ODD Grenland in a friendly match. Color Line replaced Aalesund’s former home Kråmyra Stadion which had served the home since opening back in 1977. Infamous for its poor location, and lack of matchday facilities in line with other modern football grounds, the official capacity was 9,000 however it only contained enough seats for 2,000 of the fans in attendance. 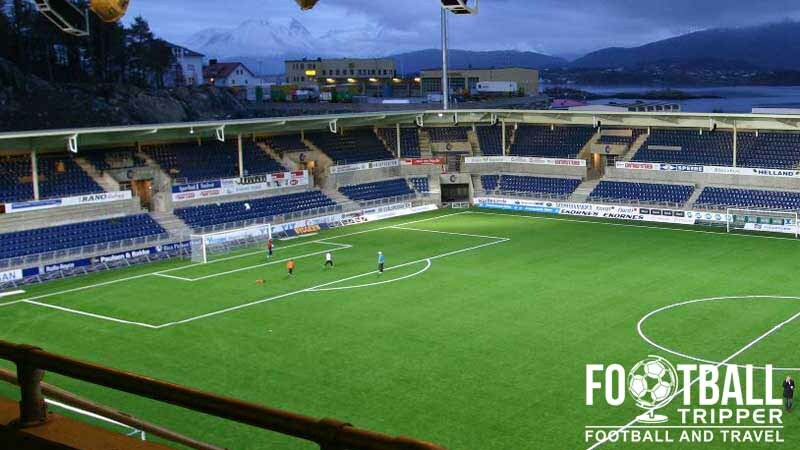 The new stadium on the other hand, which is officially referred to as Aalesund Stadion by UEFA, is capable of accommodating 10,778 supporters with a much higher ratio of seating to terracing. Designed by Biong Architects as a rectangular football ground, Color Line Stadion cost an estimated 160 million NOK to build, and is currently one of the most advanced stadiums in Norway along with Sør Arena (2007) and Viking Stadion (2004). 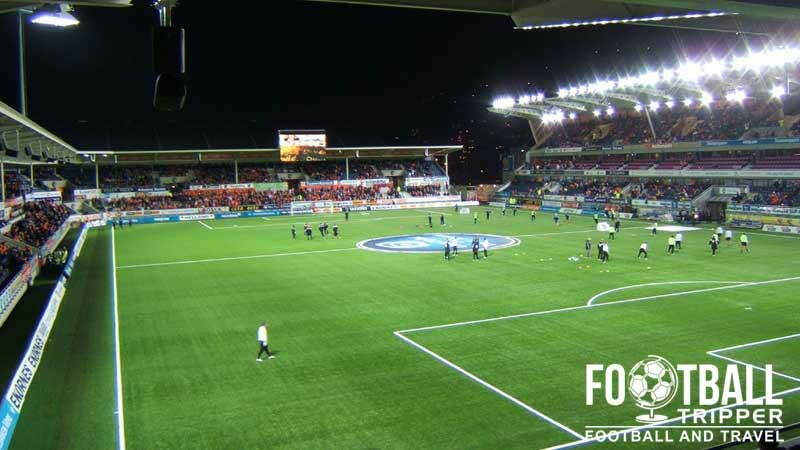 Upon opening Aalesund Stadion courted controversy by becoming the first top-flight Norwegian ground to feature the use of artificial turf. A prescient issue amongst Scandinavian countries whose pitches are susceptible to greater wear and tear due to the colder climate, the playing surface initially failed a friction test by FIFA in the Autumn of 2006. However, the turf was replaced before the start of the 2008 season and FIFA have now granted Color Line Stadion a license which means it can now host International matches. Currently it has hosted one match of the Norwegian Under 21s side against Cyprus on 3rd September 2010, and as it also hosts matches of the Women’s Premier League side FK Fortuna Ålesund there’s speculation that it could also host Women’s International matches. The record attendance of 10,903 was set on August 3rd 2005 during a home match against Hamarkameratene. As the current capacity has been reduced slightly to 10,778 for safety reasons, it is unlikely to be beaten without further renovation work. Color Line Stadion is comprised of four stands: North, East, South and West. Away fans (Bortesupportere) are housed within the northernmost point of the east stand as per the brown section (G) in the above seating plan. Official merchandise of Aalesunds FK can be purchased either from the online Tango Shop or from the fan store located at Color Line Stadion. On matchdays the club shop is usually open for up to three hours before kick-off, and is otherwise closed on Sundays. We can’t find anything online which suggests that tours of Color Line Stadion are something which Aalesunds FK do. Tickets to see Aalesunds FK can be purchased at the stadium’s box offices which open three hours before kick-off and online from the links on the official website. 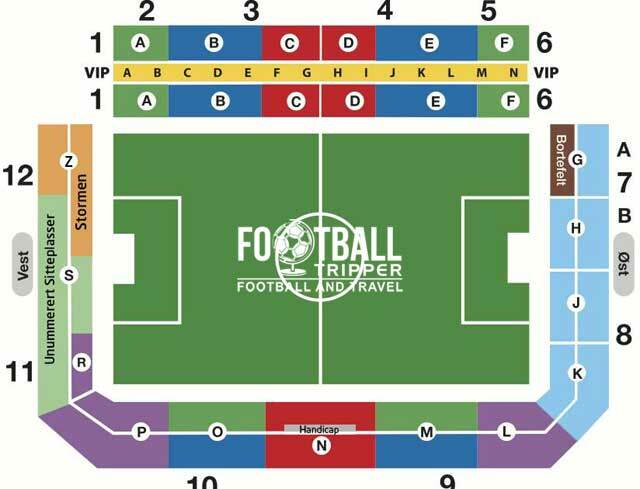 Please refer to the seating plan further up this page to find out exactly where each section is located. Most Football Trippers are looking at a walk of around 10-15 minutes to the stadium, just head over the footbridge in the city centre. Parking is available nearby at Ålesund Secondary School which sits between Color Line Arena and Sparebanken Møre Arena. The municipality of Ålesund Municipality and the wider Møre og Romsdal region doesn’t really any rail infrastructure. Another look at the exterior of Color Line Stadium, this time the back of the main stand. Return tickets on the buses usually cost 50 NIK for adults and 25 NIK for children, and they all seem to run for at least 30 minutes before kick-off and after the full time whistle. Ålesund Airport is located 20 km away from the centre of town within the area of Vigra which involves hopping across three islands! Upon landing at the international airport you can catch one of eight coach services to almost any city in the local region. The area which overlooks the harbour has plenty of competitively priced places to stay such as Radisson Blu, First Hotel Atlantica, and Thon Hotel Ålesund. You can’t really go wrong with any of the accomodation options here as they’re all three stars or more.